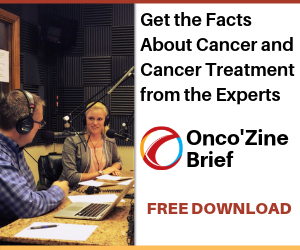 The OncoZine Brief is an interview and discussion program covering a broad range of topics and timely news updates, information and education from all oncology and hematology disciplines and sub-specialties from around the world. The OncoZine Brief, developped by Sunvalley Communication and distributed via Public Radio Exchange (PRX) is a program for healthcare professionals involved in the management and care of cancer patients as well as cancer patients and their family and friends and anyone who wishes to listen to comprehensive, updated and cutting-edge news and information about cancer – from early diagnosis to treatment. For more information about underwriting or sponsoring an episode of The Onco’Zine Brief, please contact Shaun Mehr at Sunvalley Communication. For this edition of The Onco’Zine Brief, recorded during 59th annual meeting of the American Society of Hematology held December 9 to 12, 2017 in Atlanta, Georgia, Peter Hofland and Sonia Portillo, the team behind the show, sat down with Steven E. Benner, M.D., Senior Vice President and Therapeutic Area Head for Oncology at Astellas Pharma. In this interview Hofland and Portillo ask Benner about the many changes at Astellas, the company’s focus and some of the greatest challenges the company faces. They also talk about the definition of personalized medicine, precision medicine and targeted therapies – and the differences of these approaches beyond the typical ‘buzz words’ – and how personalized medicine, is changing the drug development process. Hofland and Portillo also ask Benner to share his own impression of this year’s annual meeting (‘Real dramatic progress in the development of novel therapeutic drugs designed to maximize the patient benefit…’) and what he thinks is the most exciting clinical news presented. And, finally, Hofland and Portillo talk with Benner about the results of a poster his company presented about the “Economic Burden of Treatment Episodes in Acute Myeloid Leukemia Patients in the U.S.” Which includes new information about the major drivers of economic burden for Acute Myeloid Leukemia Patients and therapeutic strategies needed to deal with this burden. In this edition of The Onco’Zine Brief, recorded during the 59th annual meeting of the American Society of Hematology – held December 9 to 12, 2017 in Atlanta, Georgia (USA), we talk with Anna Sureda, MD, Ph.D, Head of the Hematology Department at the Catalan Institute of Oncology, Barcelona, Spain – to discuss some of the exciting developments in the treatment of patients with Hodgkin’s lymphoma, non-Hodgkin’s lymphoma and Multiple Myeloma. During our conversation we asked Dr Sureda about what she thinks about the exciting treatment options presented at the 59th Annual Meeting of the American Society of Hematology as well as the differences in how patients are being treated in the United States vs. Spain. And we asked Dr Sureda about a particular study, the ECHELON-1, about the reason for the study, the study outcomes and what the results of this study mean for patients with advanced frontline Hodgkin lymphoma. Even modest use of alcohol may increase cancer risk. The greatest risks are observed with heavy, long-term use of alcohol. Now, for the first time, the American Society of Clinical Oncology (ASCO) has formally recognized that alcohol drinking is a risk factor for multiple malignancies. This risk is, however, potentially modifiable. In this episode of The Onco’Zine Brief, recorded during CPhI World Wide, held October 24 – 27, 2017 in Frankfurt, Germany, Peter Hofland and Sonia Portillo, interview Charlie Johnson, the CEO of ADC Bio. ADC Bio, a biotechnology company developing new process technology to speed, simplify and significantly lower the production costs of the latest generation of novel anti-cancer blockbuster drugs known as Antibody-drug Conjugates or ADCs. Antibody-drug Conjugates are a new class of highly potent biopharmaceutical drugs composed of an antibody linked, via a chemical linker, to a biologically active drug or cytotoxic compound. Antibody-drug Conjugates are novel, targeted agents combining the unique and very sensitive targeting capabilities of antibodies allowing sensitive discrimination between healthy and cancer tissues with the cell-killing ability of cytotoxic drugs. Recorded during the 53rd Annual Meeting of the American Society of Clinical Oncology (ASCO), held June 2 – 6, 2017 in Chicago, Ill, Sonia Portillo and Peter Hofland, the team behind The Onco’Zine Brief, interview Dr. Steve Benner – Senior Vice President and Therapeutics Area Head of Oncology at Astellas Pharmaceuticals, and Mark Reisenauer, Senior Vice President, Oncology business unit at Astellas Pharmaceuticals. Astellas currently has several highly targeted drugs in (early) development and clinical trials. One of these investigational agents is enfortumab vedotin, which is demonstrating promising results for metastatic urothelial cancer patients that fail checkpoint inhibitor therapies or CPIs. Enfortumab vedotin is an antibody-drug conjugate or ADC designed to deliver the cell-killing, microtubule-disrupting, agent called monomethyl auristatin E or MMAE to the target Nectin-4, a cell adhesion molecule identified as an ADC target by Astellas, which is expressed on many solid tumors. Antibody-drug conjugates or ADCs are a new class of highly potent biopharmaceutical drug composed of an antibody linked, via a chemical linker, to a biologically active drug or cytotoxic compound. These novel, targeted agents combine the unique and very sensitive targeting capabilities of antibodies allowing sensitive discrimination between healthy and cancer tissues with the cell-killing ability of cytotoxic drugs. Astellas’ investigational ADC enfortumab vedotin uses Seattle Genetics’ proprietary linker technology. Lung cancer remains one of the most frequently diagnosed cancers. It is also one of the deadliest cancers – with each year more than 1.6 million tumor-related deaths worldwide. The correlation between smoking and mortality from lung cancer has been clearly confirmed and a decrease of mortality after cessation of tobacco use has been seen in the United States. Since the 1990s first in men and later, since the early 2000s also in women. Although direct environmental exposure to tobacco smoke is the predominant risk factor, inhalation of cancer causing agents such as marijuana or hookah us also contributes to the risk of lung cancer. Additional risk factors include exposure to radon, asbestos, diesel exhaust and ionizing radiation. Furthermore, the latest evidence suggests that there is a correlation between lung cancer and chronic obstructive lung disease that is independent of tobacco use and is most likely caused as a result of a genetic abnormality. In this episode of The Onco’Zine Brief Peter Hofland and Sonia Portillo interview Fred R. Hirsch, MD, PhD, Chief Executive Officer of International Association for the Study of Lung Cancer (IASLC) and a professor at the University of Colorado School of Medicine. They discuss new treatment options for patients with lung cancer. In this episode of The Onco’Zine Brief, Peter Hofland and Sonia Portillo talk with Robert Z. Orlowski, MD, PhD, chairman, Ad Interim, Director of Myeloma and Professor of Medicine in the Departments of Lymphoma, Myeloma and Experimental Therapeutics in the Division of Cancer Medicine at MD Anderson in Houston, Texas. They ask Orlowski about his thoughts and unique perspective on research and the recent advancements in the treatment multiple myeloma (a type of blood cancer), including promising results with a drug called carfilzomib (marketed as Kyprolis® by Amgen), which has become the first treatment proven to extend the overall survival of patients with relapsed multiple myeloma when compared to the current standard of care. In healthy people, normal plasma cells are found in the bone marrow and are an important part of the immune system. In patients with multiple myeloma, these cells have become malignant. These malignant plasma cells accumulate in the bone marrow, crowding out the normal plasma cells that help fight infections. In this episode of The Onco’Zine Brief, Peter Hofland and Sonia Portillo, talk with David R. Epstein B.Sc, MBA, the Executive Chairman of Rubius Therapeutics. Epstein explains how his company is pioneering novel Red-Cell Therapeutics or RCTs – nicknamed ‘superblood’ – as a new class of medicines to address a wide array of diseases. He explains how these novel drugs have leading applications in cancer, rare and autoimmune disease, as well as additional potential in hemophilia, infectious and metabolic diseases. Each year, 1.4 million people are diagnosed with lung cancer worldwide. The 5-year survival rate for these patients is only 15.9%. In this episode of the Peter Hofland and Sonia Portillo, the team behind The Onco’Zine Brief, interview Bonnie Adario, Cancer Survivor. Addario was was first diagnosed with stage 3b lung cancer in 2004, a cancer with a survival rate of only 5%. As part of her treatment, Addario underwent surgery to remove one lobe, radiation and chemotherapy treatments, and, against the odds, became a lung cancer survivor. After this experience, she felt an urgent need to impact lung cancer care in a big way. In 2006, she started the Bonnie J. Addario Lung Cancer Foundation, now one of the largest philanthropies that is exclusively dedicated to lung cancer. The foundation Addario set up has the goal of working with a diverse group of physician’s organization, industry partners, patients and survivors in efforts to find solutions and make meaningful changes in lung cancer, and they hope to turn lung cancer into a chronically managed disease by 2023. Addario’s foundation manages several projects, some in collaboration with the Addario Lung Cancer Medical Institute – an international non-profit research consortium. This research consortium, also called ‘Alchmey’, directly facilitates collaboration between investigators from over 22 institutions in the United States and Europe, and is supported by research infrastructures including centralized tissue banks and data systems. They also combine the expertise of scientific and medical professionals with patient’s access through a network of community cancer centers. This helps to accelerate research and advance ongoing projects from both the foundation and the medical institute. In this interview, Addario shares with some inside perspectives on where we are with lung cancer treatment, as well as some of the exciting projects being developed by her team at the Bonnie J. Addario Lung Cancer Foundation. Patients living with invasive breast cancer with high levels of HER3 may face a significantly worse prognosis and decreased survival. This represents a large unmet medical need. Overexpression of epidermal growth factor receptors, also known as EGFR, such as HER2 and HER3, can play a role in cancer cell development, including breast cancer. Statistics show that one in five breast cancers overexpress HER2, which is associated with a more aggressive disease. And about 50 to 70% of breast cancer tumors have detectable levels of HER3. Depending on several factors, including the biomarker classification, breast cancer is typically treated with various combinations of surgery, radiation, chemotherapy, hormone therapy or targeted therapy. But many HER2-positive tumors progress to the point where no currently approved HER2-targeting treatments can continue to control the disease. Furthermore, there is no HER2-targeting therapies approved for HER2-weak positive tumors and no approved HER3-targeting therapy options. Historically, HER3 has represented a challenge for drug development due to this receptor’s lack of tyrosine kinase activity. Peter Hofland and Sonia Portillo, the team behind The Onco’Zine Brief, sat down with Antoine Yver, MD., MSc, Executive Vice President and Global Head, Oncology Research and Development at Daiichi Sankyo to talk about Daiichi Sankyo novel antibody-drug conjugate, DS-8201, and how this investigational drug has demonstrated a favorable safety profile and promising antitumor activity. The trial drug is currently being evaluated in an open-label two-part phase I dosing study in patients with advanced, unresectable or metastatic solid tumors that are refractory or intolerant to standard treatment, or for whom no standard treatment is available. DS-8201 is being development for HER2-positive advanced or metastatic breast cancer and gastric cancer, HER2-low-expressing breast cancer and other HER2-expressing solid cancers. The primary objective of the so-called dose escalation phase of the study was to assess the safety and tolerability of DS-8201 and determine the maximum tolerated dose (MTD). To date a total of 134 patients have been treated in both the dose escalation part of the study, which included 24 patients, and dose expansion part of the study, which included 110 patients. For this edition of The OncoZine Brief, Peter Hofland and Sonia Portillo sat down with Jonathan E. Lim, M.D. co-founder of IGNYTA, and its President and Chief Executive Officer since July 2012. Lim is the Founder and Managing Partner at City Hill Ventures, a company he founded in 2010. He is also a Co-Founder of Bonti, Eclipse Therapeutics and served as the Chief Executive Officer and President of Halozyme Therapeutics from 2003 to 3, 2010 and its Executive Director from 2003 to 2010. Lim was a recipient of a National Institutes of Health Postdoctoral Fellowship, during which time he conducted clinical outcomes research at Harvard Medical School. His prior experience also includes two years of clinical training/ residency in general surgery at the New York Hospital-Cornell Medical Center and Memorial Sloan-Kettering Cancer Center; Founding Editor-in-Chief of the McGill Journal of Medicine; and basic science and clinical research at the Salk Institute for Biological Studies and Massachusetts Eye and Ear Infirmary. Lim has published articles in leading peer-reviewed medical journals such as the Annals of Surgery and the Journal of Refractive Surgery. He earned a B.S., with honors and M.S. in Molecular Biology from Stanford University, his M.D. degree from McGill University and his M.P.H. degree in Health Care Management from Harvard University. As the co-founder of Ignyta, Lim focuses on the mission of developing precision medicines that can eventually eradicate residual disease in certain, well-defined, cancer populations. This interview with Lim took place at during the 2017 Annual Meeting of the American Society of Clinical Oncology (ASCO) which took place June 2nd to the 5th in Chicago, Illinois. During our interview, Lim talked about some of the exciting data presented at ASCO, including the development of novel treatments that target gene fusions that drive tumor growth. These new approaches are focused on molecular targets rather than tumor histology, and they are changing the way we look at cancer treatment for a range of patients with unmet medical needs. Among the drugs being developed by researchers at Ignyta is entrectinib, a drug that is designed to target precise causes of certain cancer types that are caused by multiple gene rearrangements or “fusions”, all with one single therapy. During our interview, Lim explained that the company is running their clinical trials quite differently – in a form of a so-called “basket trial.” This means that they focus on a specific cancer cause regardless of the location or type of cancer. And finally, Lim explained why for certain well-defined patient populations, attacking the genomic cause of disease may not only have the potential to shrink tumors, but to eradicate relapse and recurrence altogether. In this episode of The Onco’Zine Brief Peter Hofland and Sonia Portillo talk with Alice Crisci. Alice is a cancer survivor. As part of her journey to survival Crisci founded Fertile Action, a cancer charity established to ensure fertile people touched by cancer can become mothers. As a cancer survivor and a single mom who faced issues of infertility, Alice dealt with the challenges of figuring out how preserve her fertility so that one day she could have a child. Alice own need resulted in the founding of a non-profit organization – Fertile Acton – which provides Education and Advocacy, offering empowering education to patients and physicians, and help oncologists have specific fertility conversation with patients during the treatment planning phase Crisci founded Fertile Action a few weeks after she was diagnosed with breast cancer. At that time she was just 31-years-old. Crisci also launched MedAnswers, a digital health app that connects anonymous patients, to board certified experts in various medical disciplines for personalized question and answer sessions. Recorded during the 53rd Annual Meeting of the American Society of Clinical Oncology (ASCO), Peter Hofland and Sonia Portillo, the team behind The Onco’Zine Brief, interview Dr. Robert Andtbacka, associate professor in the Division of Surgical Oncology, at the Department of Surgery at the University of Utah School of Medicine, and surgeon and investigator with the Intermountain Healthcare and Huntsman Cancer Institute. Andtbacka is a member of the Experimental Therapeutics Program, and he specializes in surgery for melanoma, soft tissue sarcomas, and cancers of the gastrointestinal tract. His research interests include novel techniques to identify how melanoma spreads through the lymph and vascular systems; resistance to targeted therapies in soft tissue sarcomas, including gastrointestinal stromal tumors; and novel therapeutics for solid tumors. In this interview Peter Hofland, Sonia Portillo and Robert Andtbacka discusses some of the exciting research presented at this year’s annual meeting of the American Society of Clinical Oncology, or ASCO, which took place June 2nd to 6th in Chicago, Illinois. Andtbacka addresses current standards of care in melanoma, and the challenges that come with treating this disease, especially once it has metastasized to the brain. He also discusses some of the approaches that are being tested and developed for melanoma, and explained why combination therapies are showing he most promise both early and late-stages of the disease. Some data presented at ASCO supports the combination of new drugs that can enhance existing therapies by altering the microenvironment of the tumor and making it more susceptible to treatments. Andtbacka talks about why therapy combinations have really transformed oncology in recent years by offering patients long term survival benefit that were previously unseen. 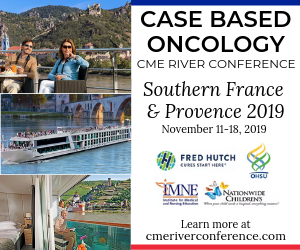 Born and raised in Curaçao NA, an island in the southern Caribbean Sea, Bob Pinedo, MD, PhD, now professor emeritus and a consultant to the Board of the Free University Medical Center in Amsterdam, The Netherlands, remains a real powerhouse in the World of Oncology. He has spent more than 40 years researching cancer biology, drug treatment and resistance, and it can be said that his accomplishments have helped to better understand cancer treatment. Here in the United States he has worked with a number of pioneers in oncology – including Dr. Bruce A. Chabner, at the National Cancer Institute (NCI) – where he conducted pharmacology studies to understand the effect of certain drugs on bone marrow stem cells. He introduced the medical community to a process of multidisciplinary treatment across hematology, surgical and radiation oncology… …and helped develop new clinical strategies. The work Dr. Pinedo did to accomplish his goal was recognized by his peers. As a result, in 2014, during the 50th aniversary of the American Society of Clinical Oncology (ASCO), he received the David A. Karnofsky Memorial Award and Lecture. First presented in 1970, the award recognizes oncologists who have made outstanding contributions to cancer research, diagnosis, or treatment. In this episode of The Onco’Zine Brief Peter Hofland and Sonia Portillo interview Nancy Brinker, founder of Susan G. Komen for the Cure. This program was originally recorded during the Annual Meeting of the American Association of Cancer Research – (AACR), held April 16 – 20, 2016, in New Orleans, Louisiana. It can be said that Nancy Brinker embodies the global movement to end breast cancer. Over the last 4 decades we’ve seen major developments and advances in the in diagnosis and treatment of cancer. Among the major changes seen is the rise of patient advocacy and how patient advocacy helps patients, their families, and their caregivers navigate the cancer landscape. The organization Nancy Brinker founded, has been a leading force in the development of patient advocacy and has changed the way the world talks about — and treats — breast cancer. In this episode Peter Hofland and Sonia Portillo, the team behind The Onco’Zine Brief, talk with Angela M. DeMichele, MD MSCE, Professor of Medicine and Epidemiology at the Perelman School of Medicine at the University of Pennsylvania. Over the last 25 years, there has been an explosion of new and vitally important, anticancer drugs. The development of these promising new therapeutic agents is generally based on preclinical and clinical research. In many cases, this research has, become prohibitively expensive. And only a relatively few investigational drugs have reached the market and successfully improved clinical outcomes in the treatment of patients with cancer and hematological malignancies. In the development of new therapies, the traditional clinical trial process of determining which drugs will ultimately benefit patients is long and expensive. Over the last few decades scientists have tried to change – and improve – the way clinical trials are conducted. Their purpose… Improving the process and improving the way novel pharmaceutical drugs are being developed. But it still takes many years and huge investments to successfully bring a new drug to market. But despite the huge efforts there is still a huge unmet medical need. While there are many novel drugs being developed to help improve the outcome and improve survival, resources are limited. Optimal use of resources requires better understanding of cancer biology, the identification of novel therapeutic targets, and the ability to address inefficiencies in the cancer clinical trials system. This may especially be so in how we treat women with metastatic, high risk, breast cancer. Based on the current limitations in how we conduct clinical trials, scientists of The Biomarkers Consortium, at the Foundation for the National Institutes of Health, are changing the way new anticancer drugs are being developed. The Foundation’s unique and groundbreaking, re-engineered approach to clinical trials is the I-SPY Clinical Trial. This trial represents an unprecedented and streamlined method in developing new anticancer drugs. Using breast cancer treatment as a model – the I-SPY TRIALs are designed to significantly reduce the overall cost, time, and number of patients required to bring innovative anticancer agents to the right patient at the right time – and do this faster. The I-SPY Trial Program integrates and links Phase I, Phase II and eventually Phase III clinical oncology trials to build a pipeline of novel anticancer agents. As a result, the new trial program accelerates the process of identifying a subset of high risk breast cancer patients that will directly benefit from these novel agents. Among the targeted drugs being investigated in the I-SPY 2 trail are antibody-drug conjugates or ADCs. Antibody-drug Conjugates are part of a new wave of targeted antibody-based products. They are novel, innovative agents at the cutting edge of oncology and hematology. During the Annual Meeting of the American Association of Cancer Research, held – April 16 – 20, 2016, in New Orleans, we sat down with Doctor Angela DeMichele, Professor of Medicine and Epi-demi-ology at the Perelman School of Medicine at the University of Pennsylvania. We asked Doctor DeMichele a number of questions about a specific part of the I-SPY-2 trial in which researchers investigated a particular antibody-drug conjugate and how a combination of drugs, including antibody-drug conjugates, can bring a substantially greater proportion of patients to the primary endpoint of pathological complete response or PCR, an outcome in which, following neoadjuvant therapy, residual invasive cancer is detected in the breast tissue and lymph nodes during surgery. And we asked her about the benefit of targeted therapy and how novel drugs like antibody-drug conjugates play a role. In this episode of The Onco’Zine Brief Peter Hofland and Sonia Portillo talk with Michael A. Caligiuri, MD, the current (2017- 2018) president of the American Association for Cancer Research | AACR. Caligiuri is director of The Ohio State University Comprehensive Cancer Center and CEO of the Arthur G. James Cancer Hospital and Richard J. Solove Research Institute, located in Columbus, Ohio. He is a renowned physician-scientist, known for his work in immunology that is focused on human natural killer cells and their modulation for the treatment of leukemia, myeloma, and glioblastoma. Well over 1,500 cancer patients have been treated on clinical protocols that have come out of Caligiuri’s laboratory. Caligiuri has been actively involved with the AACR since 1990, serving as a member, and more recently, chairperson of the Publications Committee and a member of the Clinical and Translational Cancer Research Committee, among other things. During the 2017 annual meeting of the American Association for Cancer Research | AACR, Hofland and Portillo sat down with Caligiuri to ask him about his passion, his drive and what he wants to accomplish during his tenure as president of the organization. One of Caligiuri main concerns is the health disparities in cancer that represent a major public health problem in our country. By promoting the exchange of novel ideas and information between the AACR and a wide range of professionals from academia, industry, government, and the community, Caligiuri hopes to drive a movement to help eliminate the disparities and harness the potential and maximize the many opportunities for bringing research on health disparities from bench to bedside or community, and back again. As part of this effort, he will, during his tenure as president of the AACR, bring together scientists and other professionals working in a variety of disciplines to discuss the latest findings in the field and to stimulate the development of new research in cancer health disparities. In this episode of The OncoZine Brief host Peter Hofland interviews Darrin Uecker and Richard Nuccitelli of Pulse Biosciences. The team at Pulse Biosciences has developed a technology is called Nano-pulse Stimulation, or NPS. This novel technology delivers ultra-short nanosecond pulses to stimulate cellular responses in targeted tissue. These pulses induce cells to die in a natural way. Preclinical studies indicate that NPS can stimulate the adaptive immune response, commonly known as immunogenic cell death. The new technology thus engages the immune system to clear away damaged, diseased, or aged cells and recruit cancer-attacking T cells to the tumor site. Host Peter Hofland asks Darrin Uecker and Richard Nuccitelli about the new technology, its history and how this may benefit patients. Copyright © 2010 – 2018 Sunvalley Communication. All rights reserved. Republication or redistribution of Sunvalley Communication content, including by framing or similar means, is expressly prohibited without the prior written consent of Sunvalley Communication. Sunvalley Communication shall not be liable for any errors or delays in the content, or for any actions taken in reliance thereon. Onco’Zine, Oncozine, The Onco’Zine Brief and The Onco’Zine Dossier are registered trademarks and trademarks of Sunvalley Communication around the world.